A generation ago, hospital gift shops sold cigarettes. Patients could smoke in their rooms, and doctors smoked in the hallways and in the doctors’ lounges. Eventually, hospitals arrived at the decision to ban smoking. And happily, their days of promoting disease are gone. Or are they? Cigarettes are out, but burgers, chicken wings, and cheesy pizza are in at many U.S. hospitals. The Physicians Committee’s new hospital foods report uncovers contracts detailing what happens when fast-food chains embed themselves in hospitals. Cheeseburgers and milkshakes are delivered to patients, restaurant leases are broken when profits from cancer-promoting chicken nuggets and processed meats don’t reach $1 million, and hospitals make money from the increased sales of fast food loaded with saturated fat and cholesterol. For the fifth hospital foods report, Physicians Committee experts examined more than 200 public hospitals, many of which receive government funding and treat medically underserved patients. The researchers identified hospitals with fast-food outlets, which sell meaty, cheese-laden products known to jeopardize the health of the communities the hospitals are meant to serve. Chick-fil-A has at least 20 hospital locations, McDonald’s has at least 18, and Wendy’s has at least five, according to Physicians Committee research (see infographic). Many other national and local restaurants selling unhealthful meat and dairy products are also located in U.S. hospitals. Through state public records act requests, the hospital food report sheds light on five contracts between public hospitals and fast-food chains that promote the consumption of foods loaded with disease-causing saturated fat and cholesterol. Ben Taub General Hospital | Houston, Texas - The average cost of a Big Mac in the United States is $4.80. That means the McDonald’s at Ben Taub General Hospital needs to sell more than 208,000 Big Macs every year to hospital visitors. Why? The restaurant can terminate its lease if yearly gross sales of Big Macs and other junk foods do not reach $1 million. Moreover, the monthly rent McDonald’s pays to the hospital increases based on food sales. The contract also lists ways that McDonald’s can promote food to hospital visitors, including a listing on the lobby directory and directional signage near the main elevators, emergency entrance, pharmacy, clinic, and parking garage. Right now, McDonald’s is the only fast-food restaurant in Ben Taub, but that could change. The lease lists several foods—including fried chicken and pizza—that the hospital or other tenants are allowed to sell in other areas of the hospital. Georgia Regents Medical Center/Children’s Hospital of Georgia | Augusta, Ga. - Want a Big Mac delivered to your hospital bed? The lease for McDonald’s at Georgia Regents Medical Center/Children’s Hospital of Georgia includes “value-added programs” that McDonald’s may provide to patients, including “McDelivery,” Happy Meals, birthday parties, and a snack menu that includes ice cream and nacho chips with cheese. The Georgia Regents contract also allows McDonald’s to adjust its prices, which could increase sales. Meanwhile, Americans pay a huge health and monetary toll every year for cheap fast-food meals: $147 billion for obesity, $245 billion for diabetes, and $313 billion for heart disease. Grady Hospital | Atlanta, Ga. - The lease between Atlanta’s Grady Hospital and McDonald’s establishes a base rental rate that increases as McDonald’s profits increase. That may be why the lease requires McDonald’s to operate from 6 a.m. to 3 a.m.
McDonald’s also negotiated exclusivity at the hospital. Its lease states that without McDonald’s consent, Grady may not lease space to “Burger King, Wendy’s, Bojangles, Kentucky Fried Chicken, Pizza Hut, Taco Bell, Carl’s, Jr.,” or restaurants “of a similar nature” to McDonald’s. An analysis published in Nutrition and Cancer: An International Journal found that Chick-fil-A chicken samples commonly contain PhIP, a carcinogen linked to breast, colon, and prostate cancer. PhIP has been on the California governor’s list of carcinogenic chemicals for more than a decade. Erie County Medical Center | Buffalo, N.Y. - Erie County Medical Center has a contract with Benderson Development Company Inc., which leases space in the hospital to Canadian fast-food restaurant Tim Hortons, which serves unhealthful breakfast sandwiches, baked goods and other obesity-prmoting foods in the hospital 24 hours a day. When Erie approved Benderson’s rental of the space, it did so with the expectation that Benderson would “focus on healthcare related enterprises,” raising obvious questions about Tim Hortons. The Physicians Committee’s hospital reports are influencing improvements. Two hospitals featured in Physicians Committee hospital food reports have removed junk food: McDonald’s closed at Riley Hospital for Children of Indiana University Health and St. Louis Children’s Hospital no longer carries Dairy Queen products. 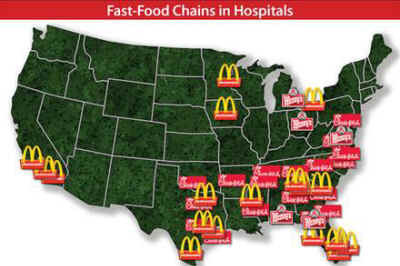 Several other fast-food restaurants have also recently closed in hospitals around the country. There is also a trend among hospitals to incorporate more fruits and vegetables grown in their own organic gardens into cafeteria and patient meals. This summer, St. Luke’s Hospital Anderson Campus in Easton, Pa., in partnership with the Rodale Institute, which pioneered organic farming, announced that it will begin offering patients organic produce grown on a five-acre organic farm located on the hospital campus. The produce will also be available to employees, visitors, and caregivers. During the first year, it expects to produce approximately 44,000 pounds of fresh produce. Hospitals in Vermont and Michigan have implemented similar programs. But hospitals that have contracts with fast-food restaurants encourage patients, employees, and visitors to eat the very foods—loaded with saturated fat and cholesterol—that hospitalize millions of Americans every year with complications from obesity, diabetes, heart disease, and cancer. When hospitals with fast-food contracts follow the lead of those that have removed fast food from their premises—and instead promote more fruits, vegetables, grains, and legumes—they will be on the path toward improving patient outcomes and helping reverse diet-related chronic disease epidemics in the communities they serve.